Kingpin the gull is absolutely flying at the moment. When we last reported him on Friday he was in Cornwall and he has barely stopped flying since. He left Cornwall near Mevagissey at 1222 on Friday and flew over to France in five hours. He continued through Brittany before coming to rest at Île Longue harbour at 2029. He was still there resting 8 hours later before being picked up a couple of hours later (0934) just off the coast near Primelin. 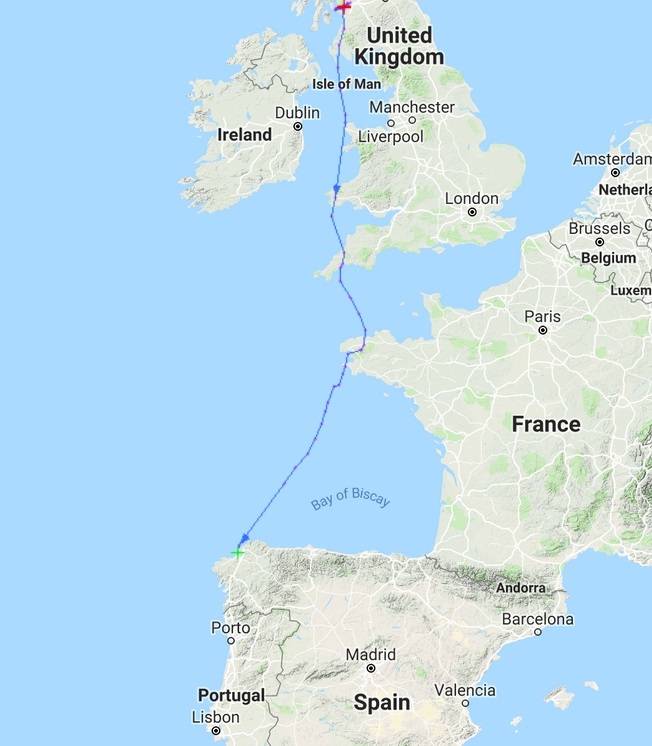 He then flew across the Bay of Biscay in a south westerly direction for 19 hours before his last update this morning (9th) where he was just a few 100 metres off the coast of Spain at A Coruña. So since leaving Lochwinnoch on Thursday afternoon his stats so far:- are a 28 hour flight to France followed by an 8-10 hour rest before flying another 19 hours to Spain. Cmon Kingpin! !